On the first day of Spring Break early in the morning, we woke up to pouring rain, well not just pouring it was raining BUCKETS! I took Dan to work at about 7am. Our street is known for flooding so I was relieved when I saw that it looked pretty clear. But BYUH was a mess. I've never driven in rain puddles that deep. I was going to go to the gym but was afraid to drive any further so I drove home went into my room to workout and a half hour later I get a phone call from neighbor asking if our house was flooding??! 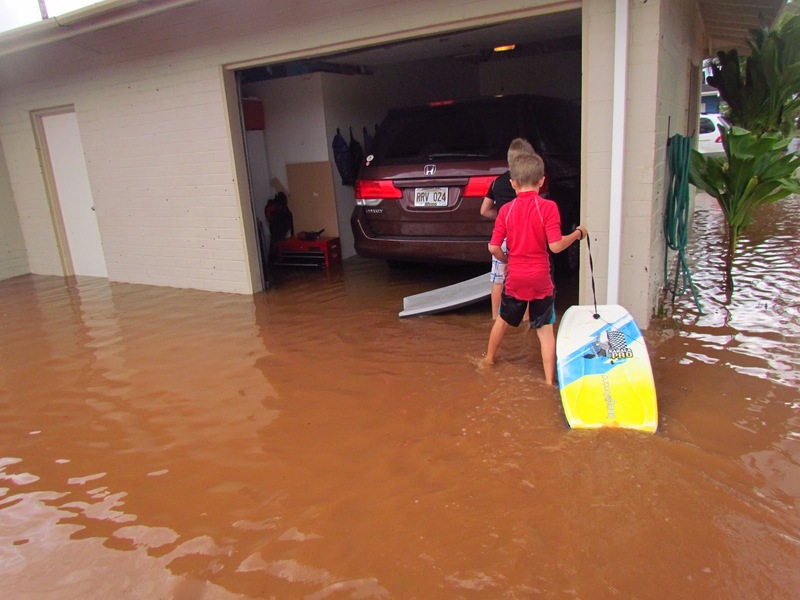 Sure enough we looked outside and the water was almost into our front door!. PANIC! Dan was stuck at work, so it was the kids and I. 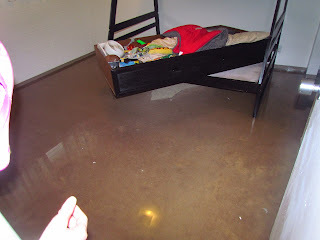 We ran to the room in our house that was ground level and sure enough water was coming in through the garage. So we had to hurry move everything up to higher ground, luckily some sweet boys from the neighborhood came and helped with dressers and heavy items. I was seriously blow away by the generosity of the whole community. People I didn't even know where walking around seeing what they could do to help. Dinner was brought to us. Sand bags delivered. Our street, driveway, and front lawn. 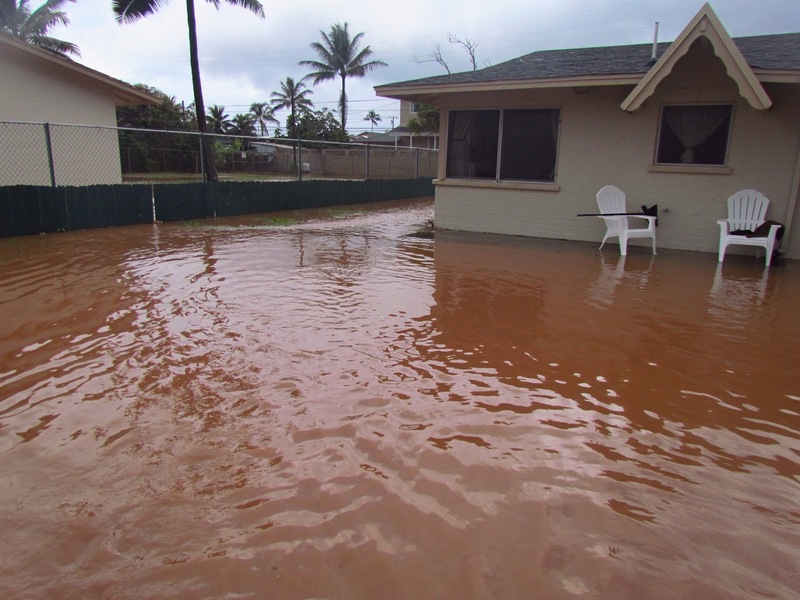 We were told two more storms were expected that same day and the water on our street was not draining due to clogged drains and it was beginning to rain again. Three years ago our street had so much damage from a flood that everyone had a foot a water throughout the house, they lost their cars and had to move out for 6 months while the repairs were being done. So needless to say every one was in panic mode. 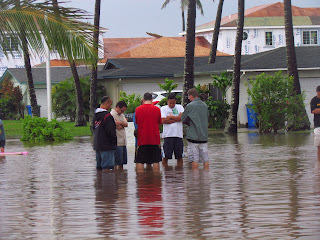 The picture below is our Stake Presidency and others from the neighborhood in knee length water offering prayer. After the prayer it was quite powerful how the rain stopped and drains opened, the street was drained within the hour. 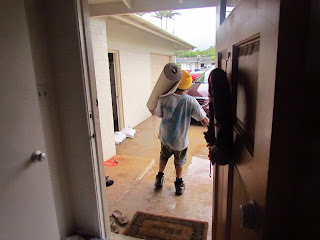 BYUH was at our house one hour after the back room drained and had the wet carpet pulled out and cleaned up. They decided to put tile in the back bedroom that flooded. Probably a good idea! Wow!! That's pretty crazy. So neat to see how everyone helps out in communities like that! Good thing that people in your community are willing to help each other in times of need. 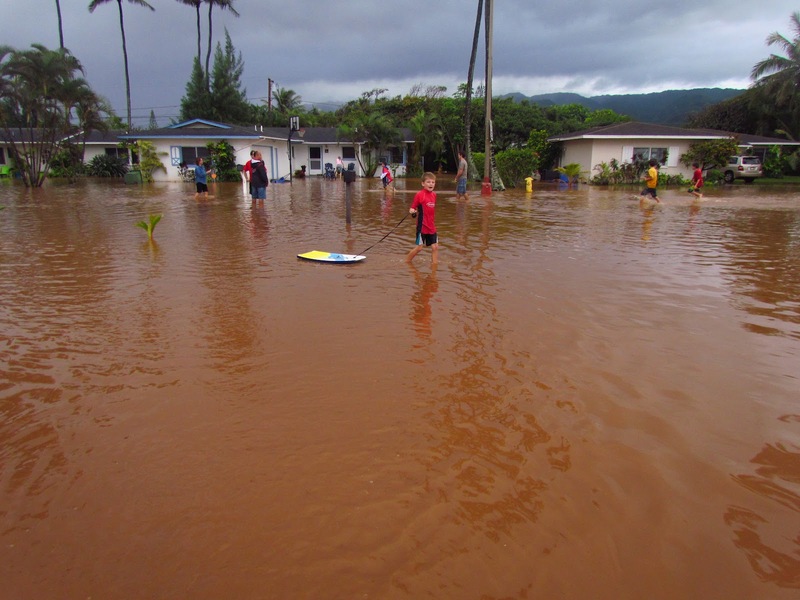 It would be better if your community creates a storm water management system, as this can help prevent water contamination and flood. Simply using a rain garden or a rain barrel can also be beneficial as water can be conserved and reused. I agree with you, Sharon. 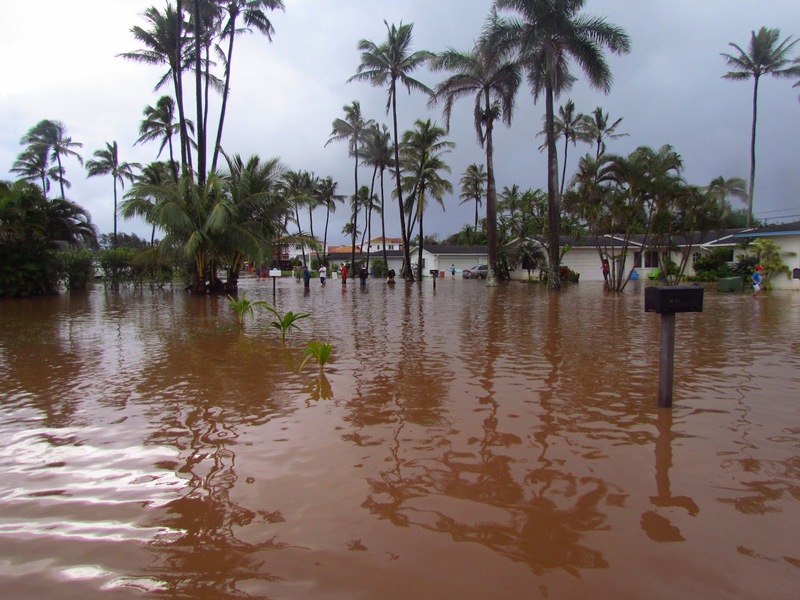 One solution is to have a storm water chamber. It can be used to harvest rainwater which can be reused for irrigation, washing cars, landscaping, pressure washing, and other lawn watering needs.